Pulse on the TDL Market A Comprehensive Assessment of Workforce Needs in the Transportation, Distribution & Logistics Sector April 2012. 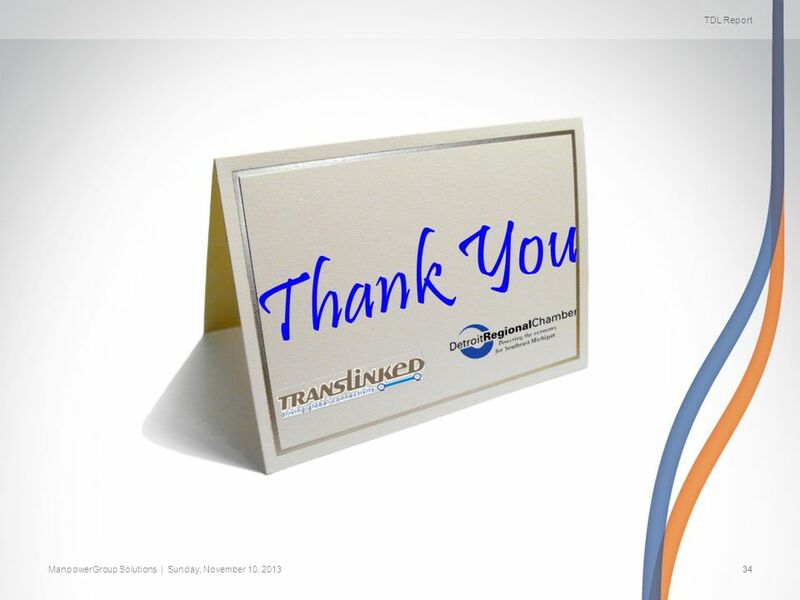 7 TDL Report ManpowerGroup Solutions | Sunday, November 10, 20137 Overall Trends 1. 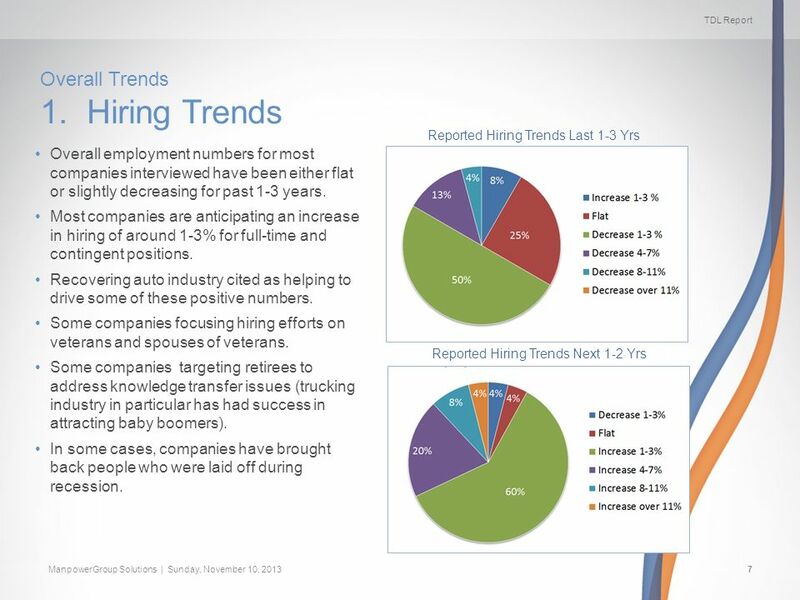 Hiring Trends Reported Hiring Trends Last 1-3 Yrs Reported Hiring Trends Next 1-2 Yrs Overall employment numbers for most companies interviewed have been either flat or slightly decreasing for past 1-3 years. 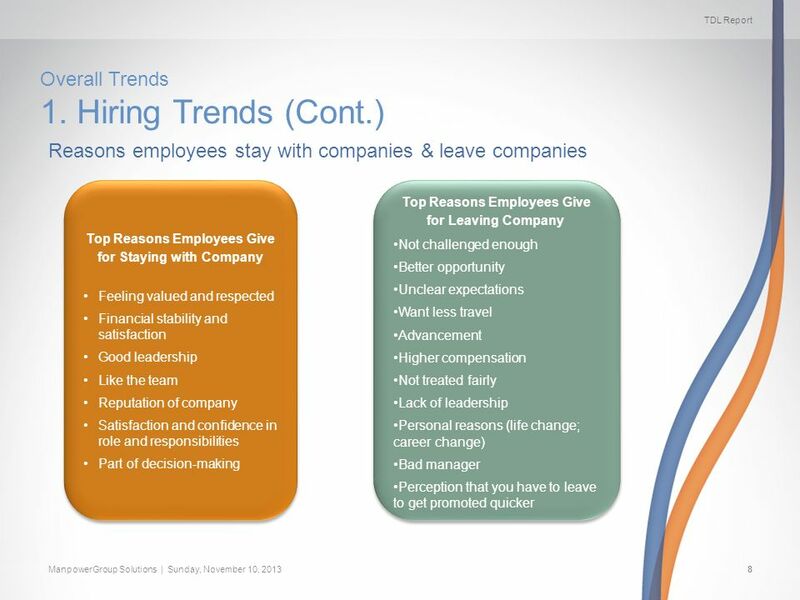 Most companies are anticipating an increase in hiring of around 1-3% for full-time and contingent positions. Recovering auto industry cited as helping to drive some of these positive numbers. Some companies focusing hiring efforts on veterans and spouses of veterans. Some companies targeting retirees to address knowledge transfer issues (trucking industry in particular has had success in attracting baby boomers). 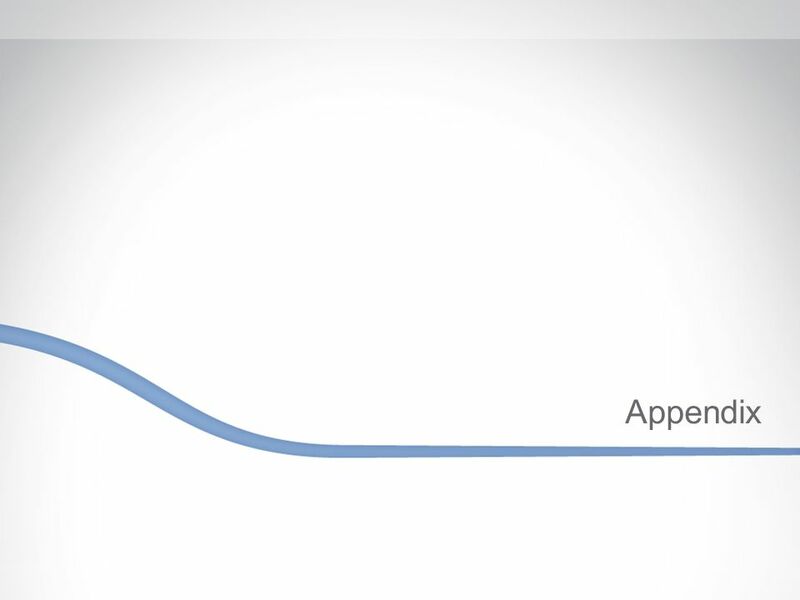 In some cases, companies have brought back people who were laid off during recession. 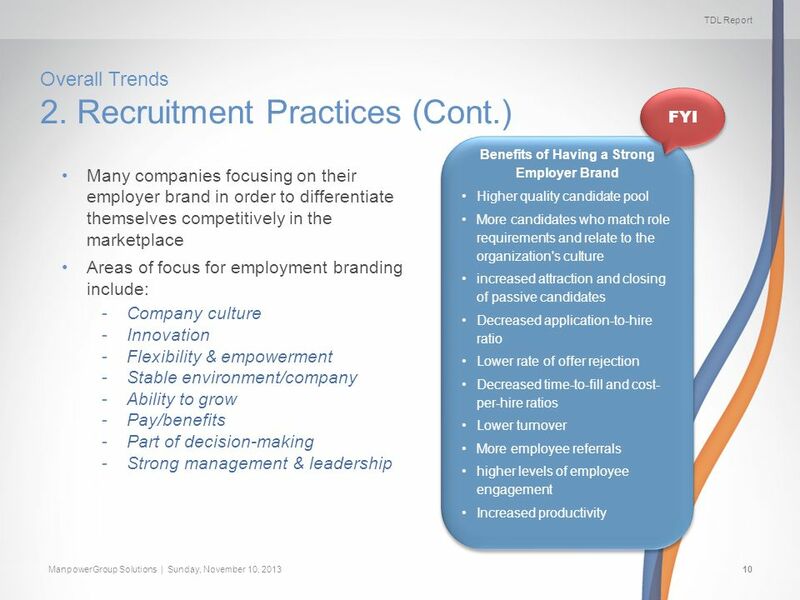 9 TDL Report ManpowerGroup Solutions | Sunday, November 10, 20139 Overall Trends 2. 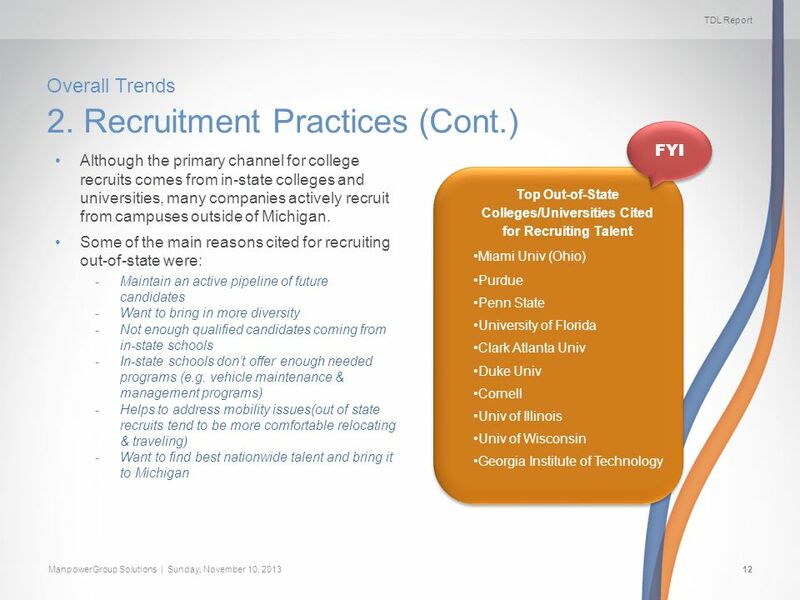 Recruitment Practices Most organizations use internal HR/Recruitment organizations to find talent. 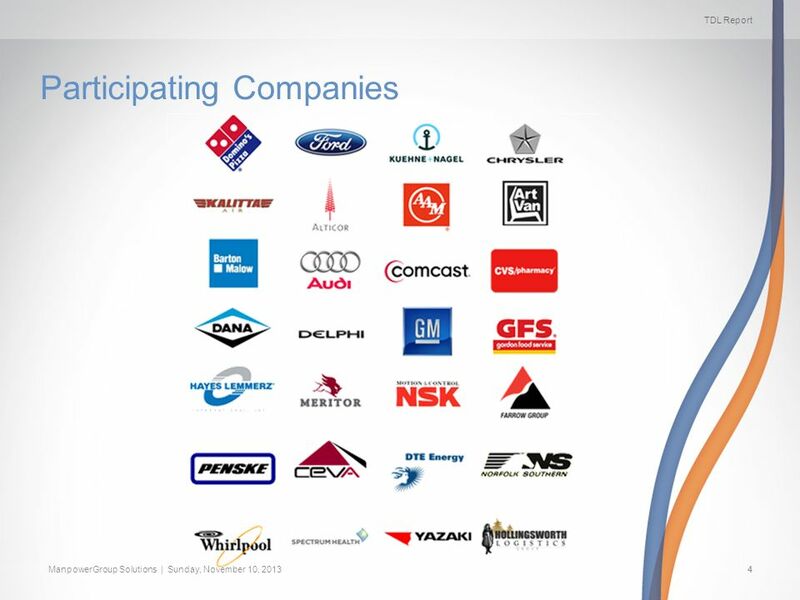 Sourcing channel cited most frequently is career page on a companys own website (very few use print advertising). Many focus on internal networking and hiring & promoting from within when possible. 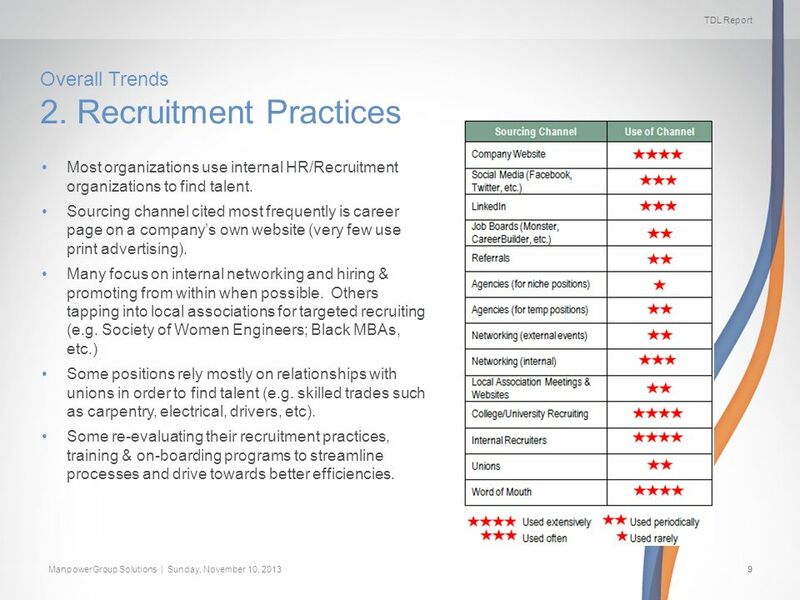 Others tapping into local associations for targeted recruiting (e.g. Society of Women Engineers; Black MBAs, etc.) Some positions rely mostly on relationships with unions in order to find talent (e.g. skilled trades such as carpentry, electrical, drivers, etc). Some re-evaluating their recruitment practices, training & on-boarding programs to streamline processes and drive towards better efficiencies. 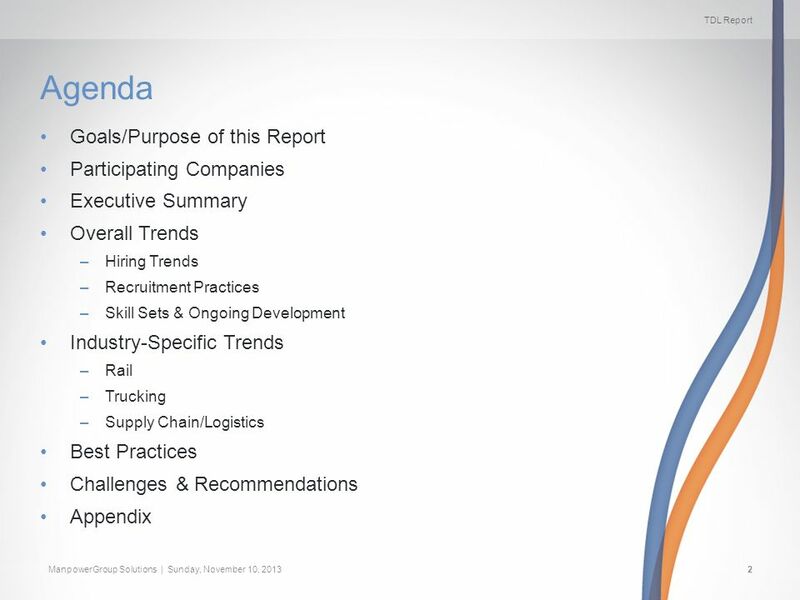 17 TDL Report ManpowerGroup Solutions | Sunday, November 10, 201317 Industry Specific Trends 1. Rail The Freight Railroad Administration (FRA) has identified six industry challenges that have been included in USDOT Framework for a National Transportation Workforce Strategy: Aging railroad workforce – highlighting need for knowledge transfer. 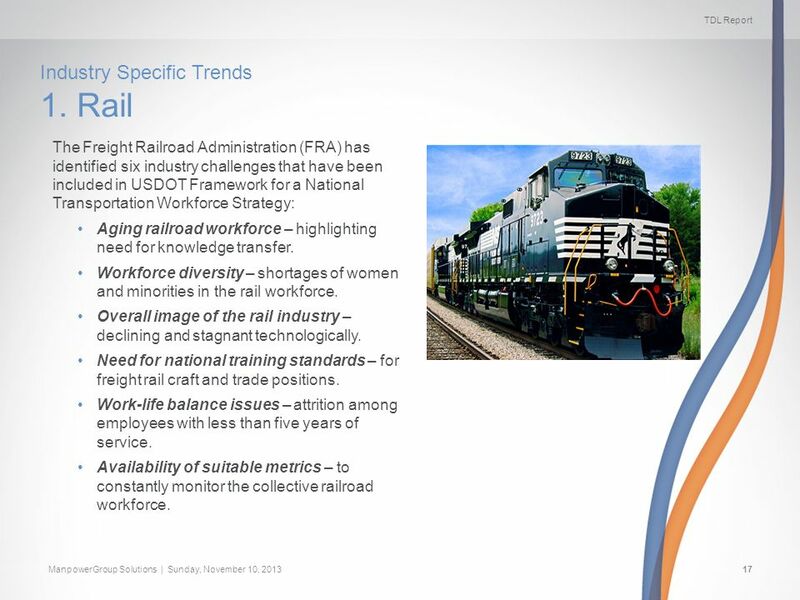 Workforce diversity – shortages of women and minorities in the rail workforce. 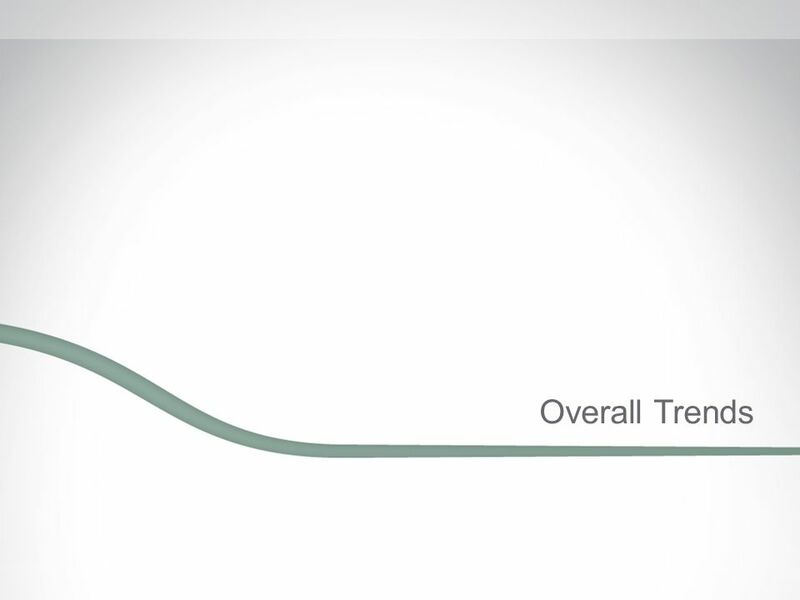 Overall image of the rail industry – declining and stagnant technologically. Need for national training standards – for freight rail craft and trade positions. Work-life balance issues – attrition among employees with less than five years of service. 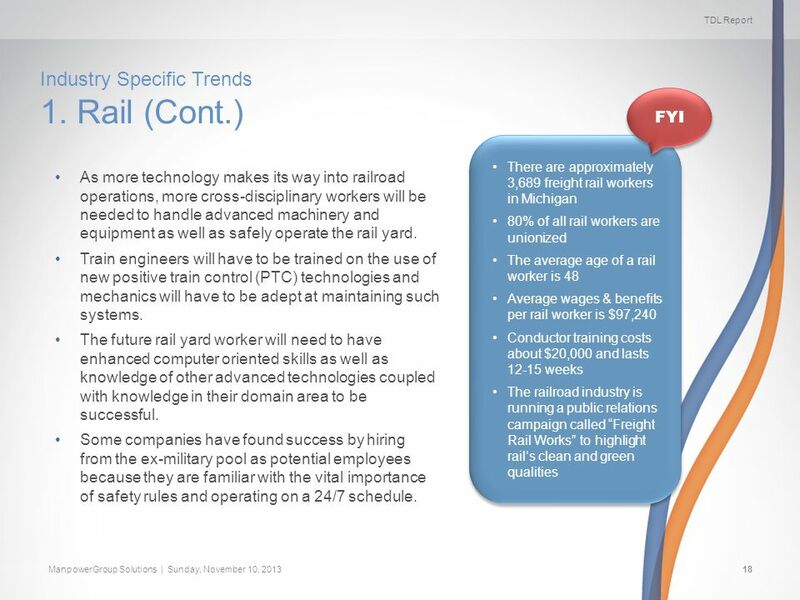 Availability of suitable metrics – to constantly monitor the collective railroad workforce. 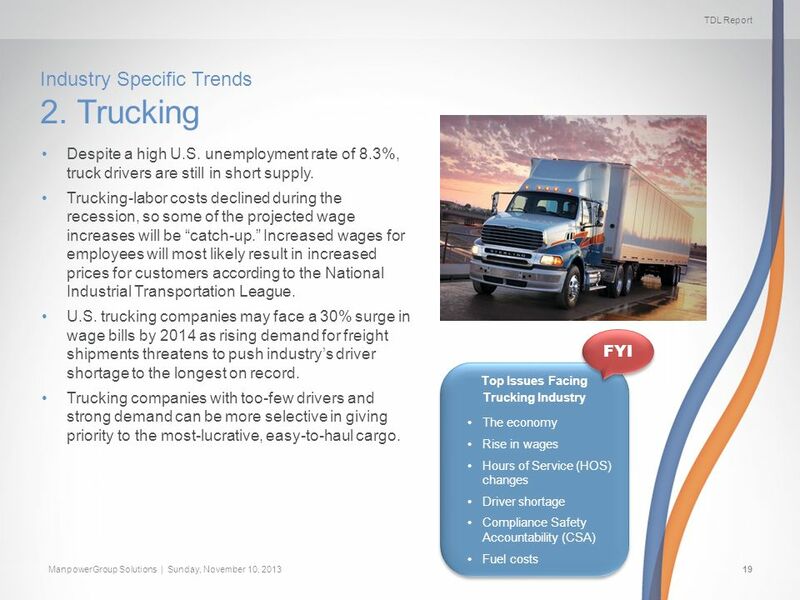 20 TDL Report ManpowerGroup Solutions | Sunday, November 10, 201320 There are approximately 45,660 Heavy and Tractor-Trailer Truck Drivers in Michigan There will be a national shortfall of approximately 300,000 full-time trucking positions by 2013 (10% of the workforce) Fleet operators spend around $5,000 to $8,000 to recruit and train a new driver There are approximately 45,660 Heavy and Tractor-Trailer Truck Drivers in Michigan There will be a national shortfall of approximately 300,000 full-time trucking positions by 2013 (10% of the workforce) Fleet operators spend around $5,000 to $8,000 to recruit and train a new driver FYI Industry Specific Trends 2. Trucking (Cont.) Training for truck drivers generally provided by private training schools. Courses are typically 4-6 weeks long and cost several thousand dollars. 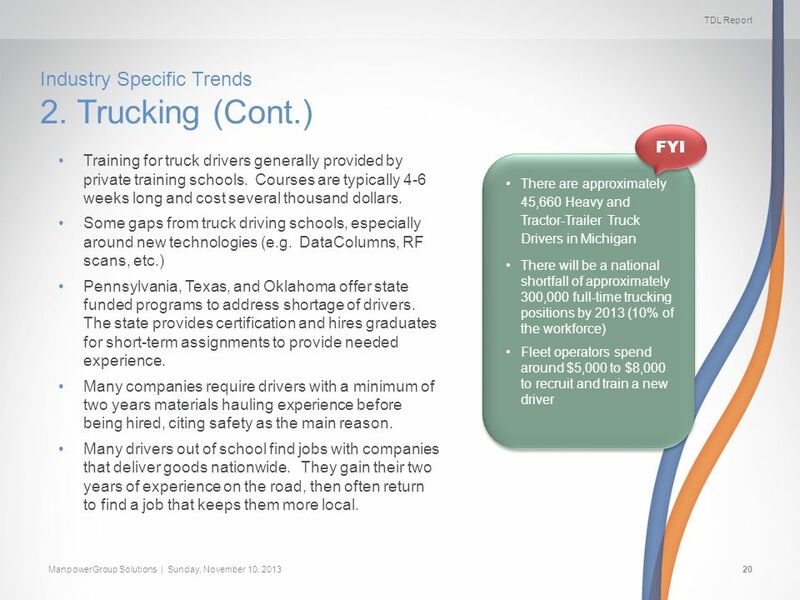 Some gaps from truck driving schools, especially around new technologies (e.g. DataColumns, RF scans, etc.) Pennsylvania, Texas, and Oklahoma offer state funded programs to address shortage of drivers. The state provides certification and hires graduates for short-term assignments to provide needed experience. Many companies require drivers with a minimum of two years materials hauling experience before being hired, citing safety as the main reason. Many drivers out of school find jobs with companies that deliver goods nationwide. They gain their two years of experience on the road, then often return to find a job that keeps them more local. 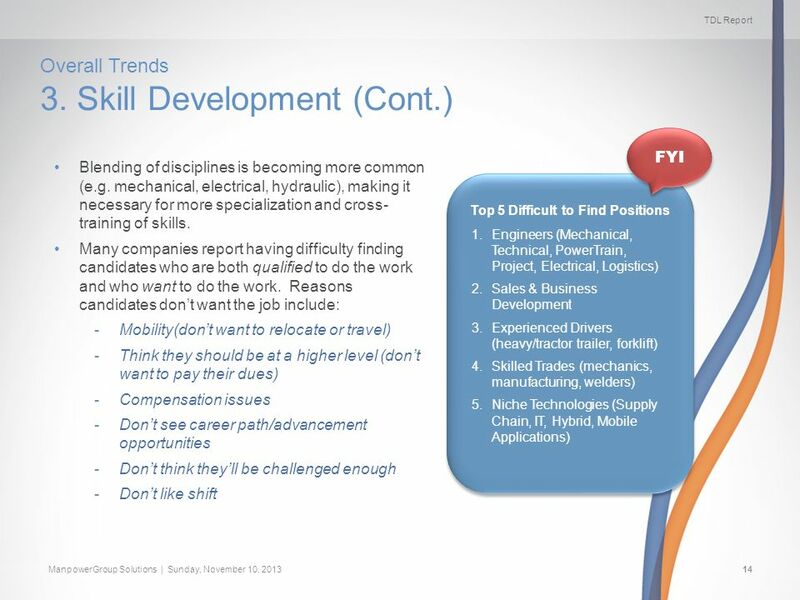 21 TDL Report ManpowerGroup Solutions | Sunday, November 10, 201321 Industry Specific Trends 3. Supply Chain/Logistics Previously discrete sectors of warehousing, freight forwarding and logistics consulting & planning are converging at a rapid pace with the rising importance of holistic supply chain management. 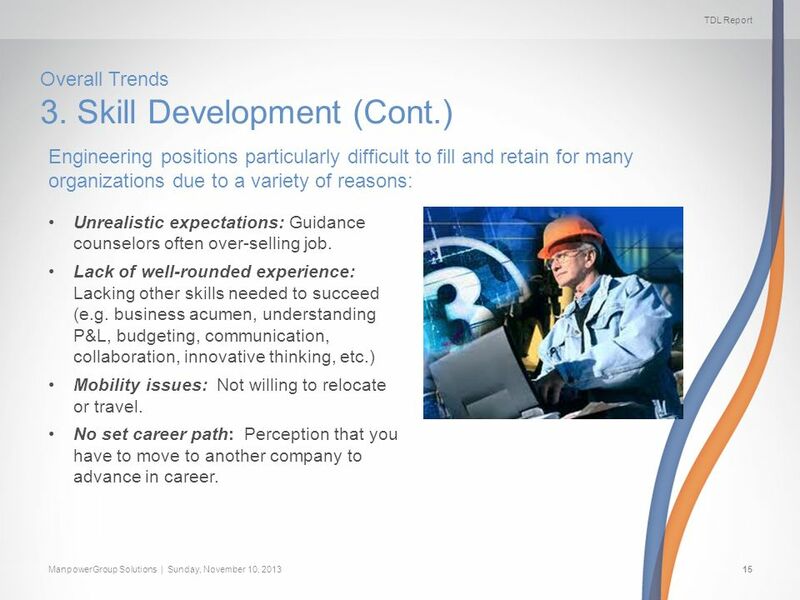 Soft skills and cross cultural skills becoming increasingly important as supply chains become more global. Cross functional skills also gaining importance. 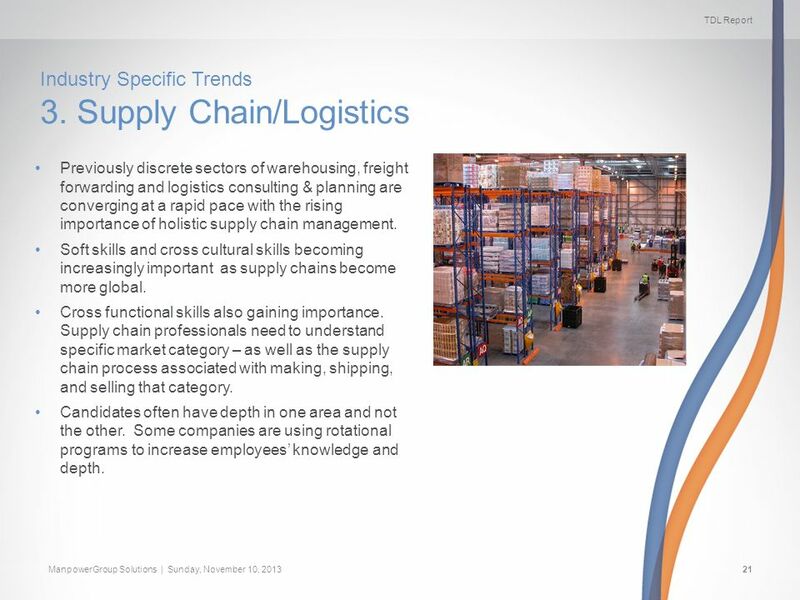 Supply chain professionals need to understand specific market category – as well as the supply chain process associated with making, shipping, and selling that category. Candidates often have depth in one area and not the other. Some companies are using rotational programs to increase employees knowledge and depth. 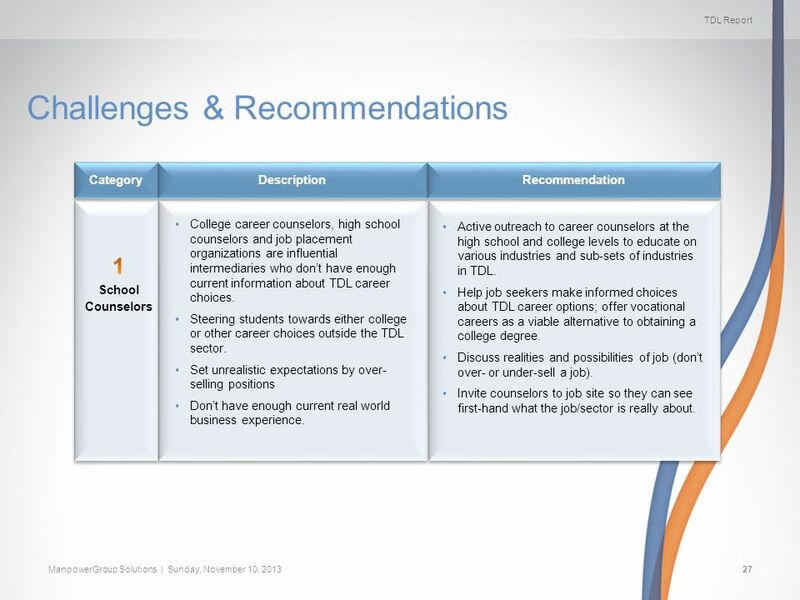 27 TDL Report ManpowerGroup Solutions | Sunday, November 10, 201327 Challenges & Recommendations Recommendation Description Category College career counselors, high school counselors and job placement organizations are influential intermediaries who dont have enough current information about TDL career choices. 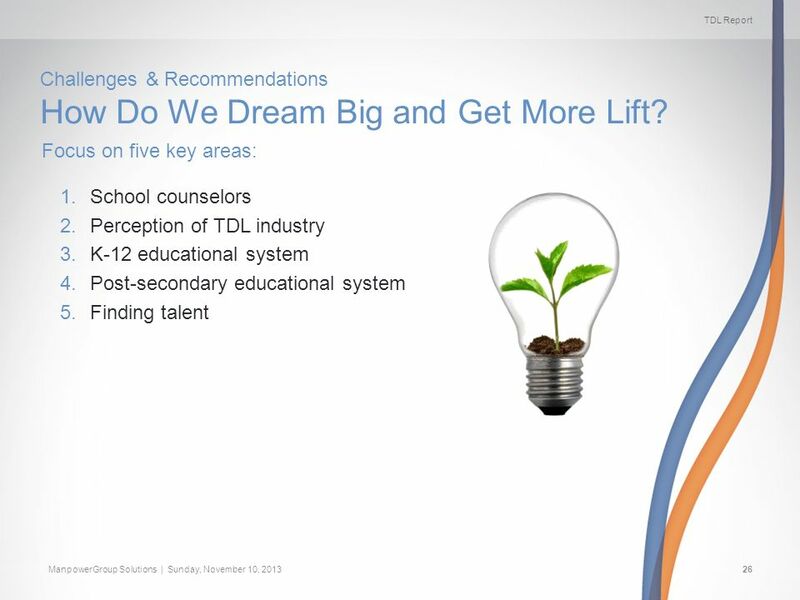 Steering students towards either college or other career choices outside the TDL sector. Set unrealistic expectations by over- selling positions Dont have enough current real world business experience. Active outreach to career counselors at the high school and college levels to educate on various industries and sub-sets of industries in TDL. Help job seekers make informed choices about TDL career options; offer vocational careers as a viable alternative to obtaining a college degree. Discuss realities and possibilities of job (dont over- or under-sell a job). Invite counselors to job site so they can see first-hand what the job/sector is really about. 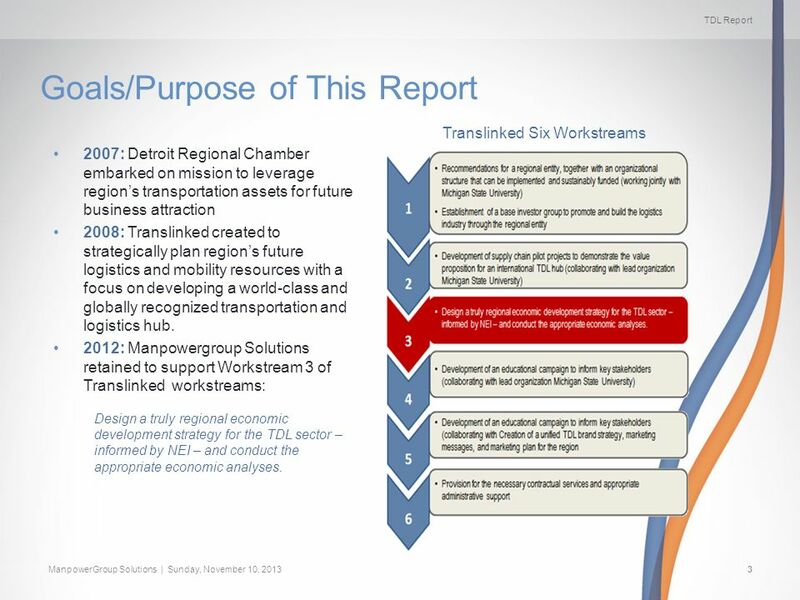 28 TDL Report ManpowerGroup Solutions | Sunday, November 10, 201328 Challenges & Recommendations (Cont.) 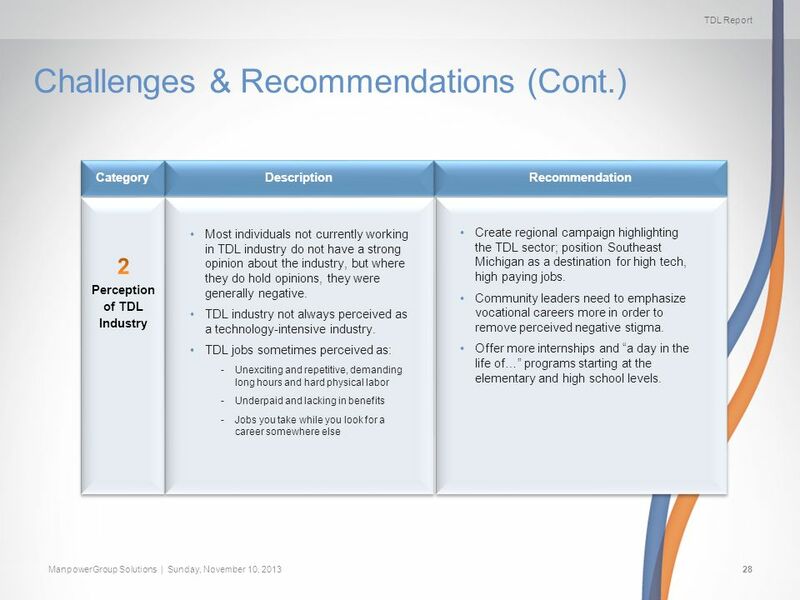 Recommendation Description Category Most individuals not currently working in TDL industry do not have a strong opinion about the industry, but where they do hold opinions, they were generally negative. 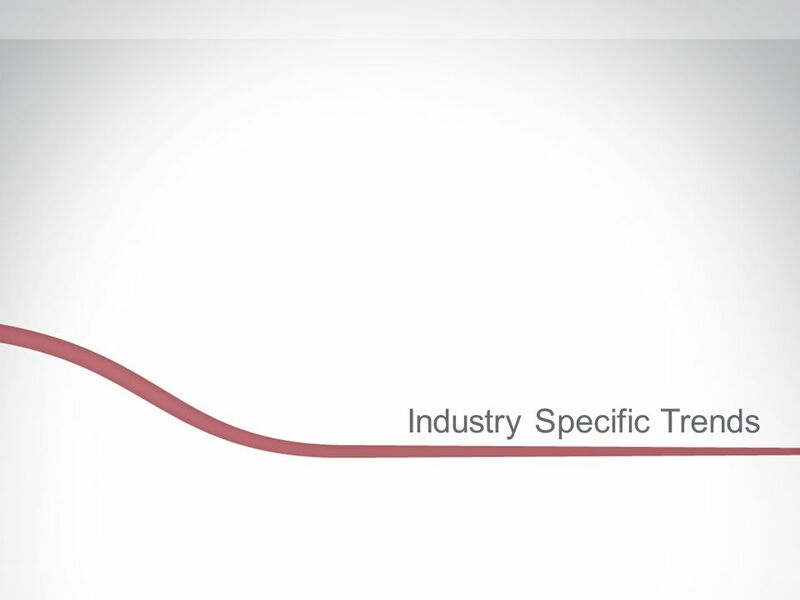 TDL industry not always perceived as a technology-intensive industry. TDL jobs sometimes perceived as: -Unexciting and repetitive, demanding long hours and hard physical labor -Underpaid and lacking in benefits -Jobs you take while you look for a career somewhere else Create regional campaign highlighting the TDL sector; position Southeast Michigan as a destination for high tech, high paying jobs. Community leaders need to emphasize vocational careers more in order to remove perceived negative stigma. Offer more internships and a day in the life of… programs starting at the elementary and high school levels. 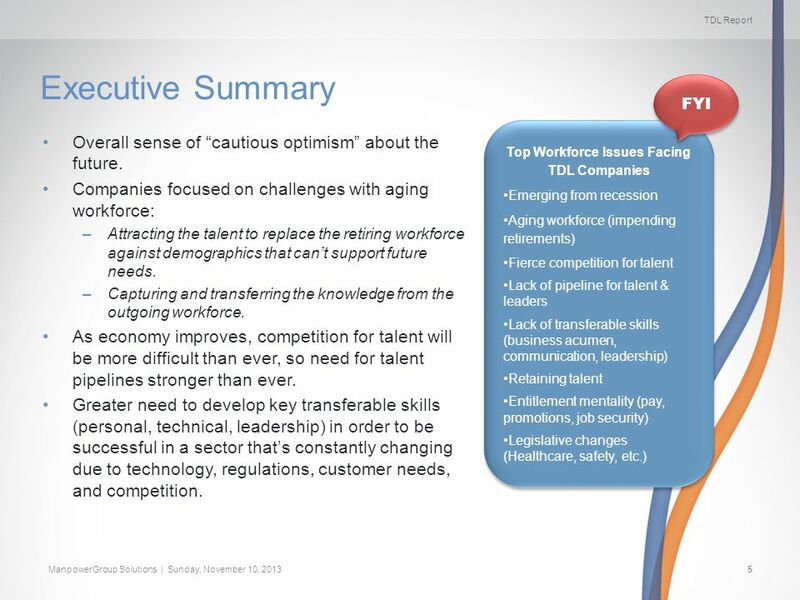 29 TDL Report ManpowerGroup Solutions | Sunday, November 10, 201329 Challenges & Recommendations (Cont.) Recommendation Description Category Companies consistently cited a lack of vocational training at the high school level to better identify and prepare candidates for jobs; not enough appreciation of craft. Also cited consistently was a lack of foundational skills in math, science and technology that should begin and be developed at a young age. More efforts to spark interest in kids at an early age (K-12) around such things as innovation, critical thinking, problem solving, etc. Begin building pipeline of future workers at an earlier stage; keep them involved throughout their education. 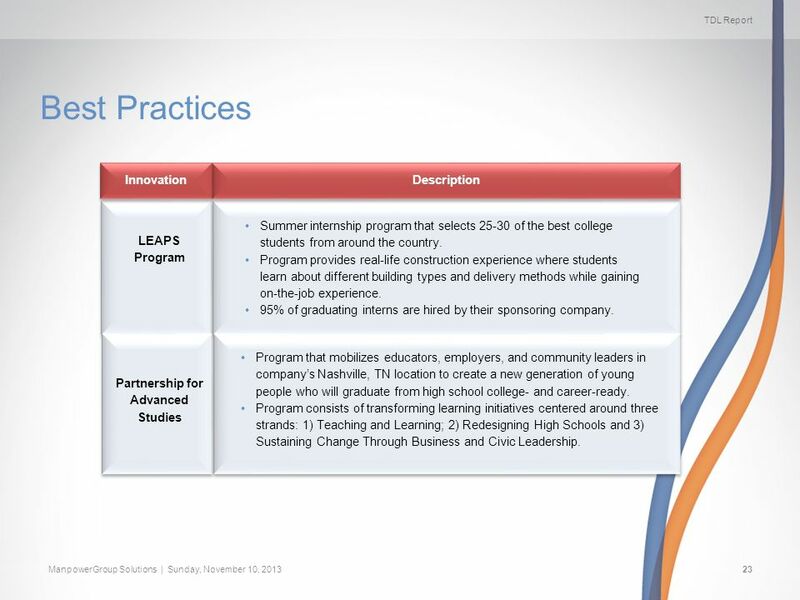 Reinvigorate vocational programs; remove perception that everyone must go to college. More partnerships between the business community and schools (e.g. Software Engineering Academy in New York City sponsored by Mayor Bloomberg and IT business leaders). 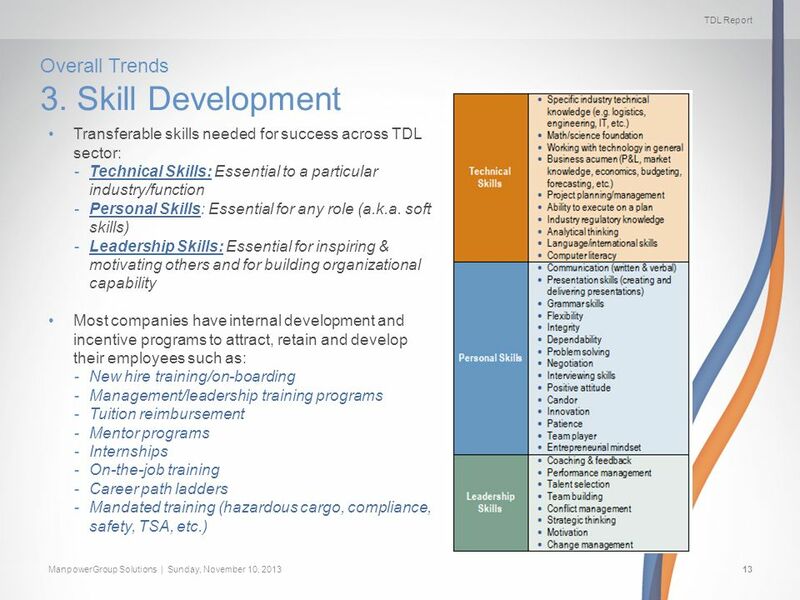 30 TDL Report ManpowerGroup Solutions | Sunday, November 10, 201330 Challenges & Recommendations (Cont.) 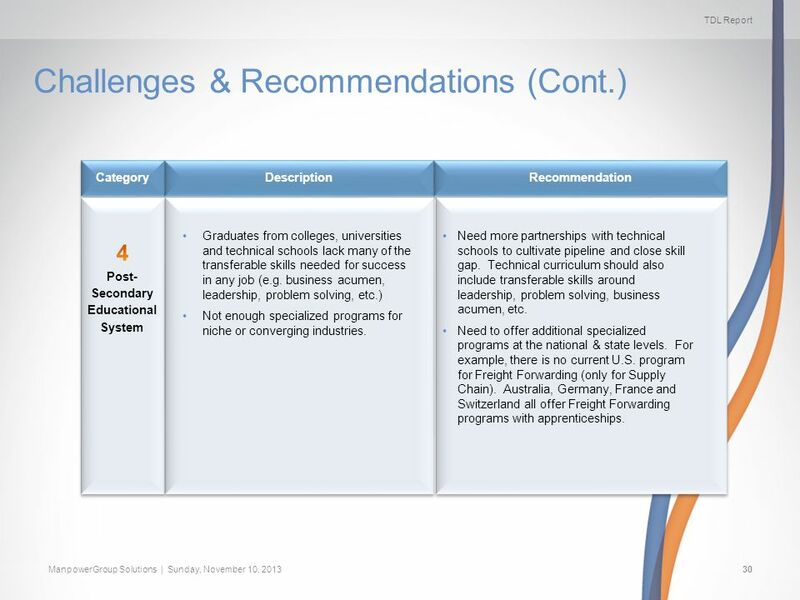 Recommendation Description Category Graduates from colleges, universities and technical schools lack many of the transferable skills needed for success in any job (e.g. business acumen, leadership, problem solving, etc.) Not enough specialized programs for niche or converging industries. Need more partnerships with technical schools to cultivate pipeline and close skill gap. Technical curriculum should also include transferable skills around leadership, problem solving, business acumen, etc. Need to offer additional specialized programs at the national & state levels. For example, there is no current U.S. program for Freight Forwarding (only for Supply Chain). Australia, Germany, France and Switzerland all offer Freight Forwarding programs with apprenticeships. 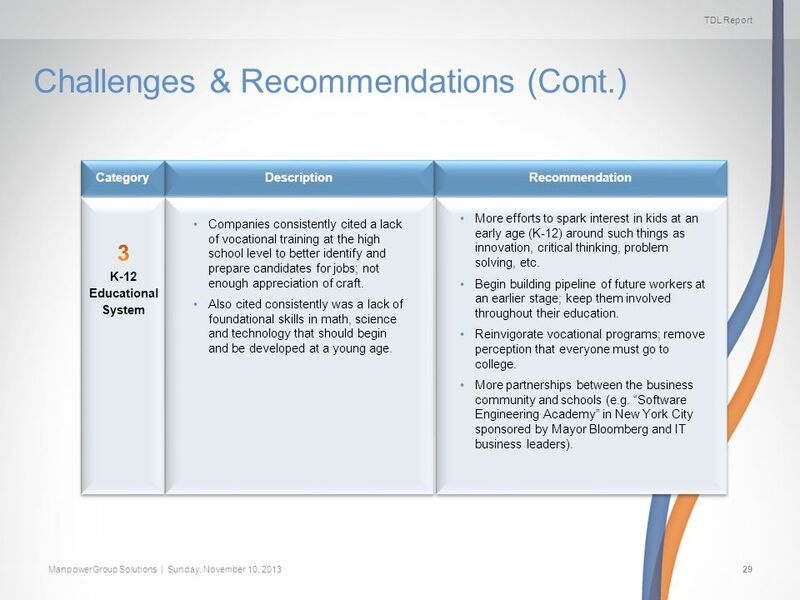 31 TDL Report ManpowerGroup Solutions | Sunday, November 10, 201331 Challenges & Recommendations (Cont.) 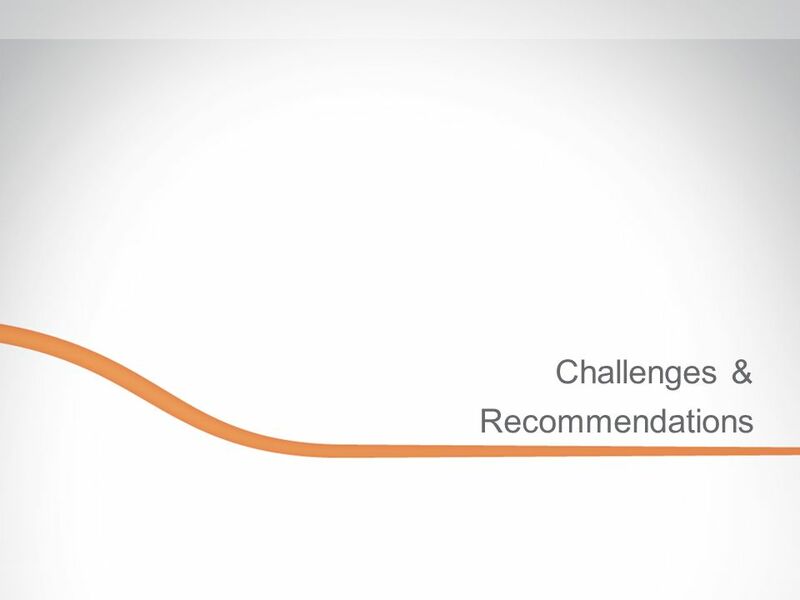 Recommendation Description Category Increased competition for talent with shrinking demographics to meet future needs. Lack of unified plan to address talent shortage at a regional level. 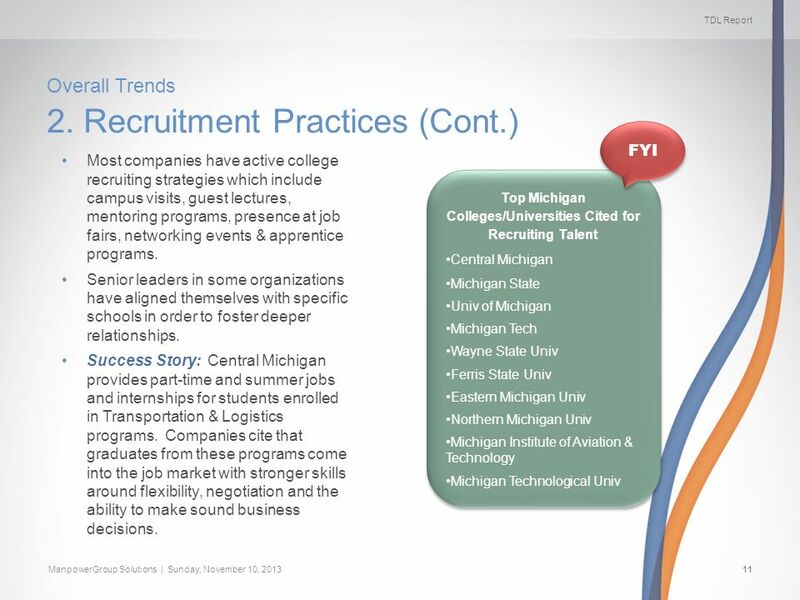 Some local business, community and political leaders cited as being too focused on looking for talent within Michigan and trying to keeping the talent here once they graduate. Look more holistically at all factors that go into finding talent (transferable skills, technical skills, demographics, commute times, quality of life in communities, etc.) to build local and regional TDL sourcing & recruiting strategies. See benefit in mobility into and out of the state (helping to produce more well-rounded people who may come back to Michigan with greater skillsets. Elevate skillset of entire region by offering incentives for employees to gain broader experience (abroad or in other states) then come back home to apply skills and knowledge locally. 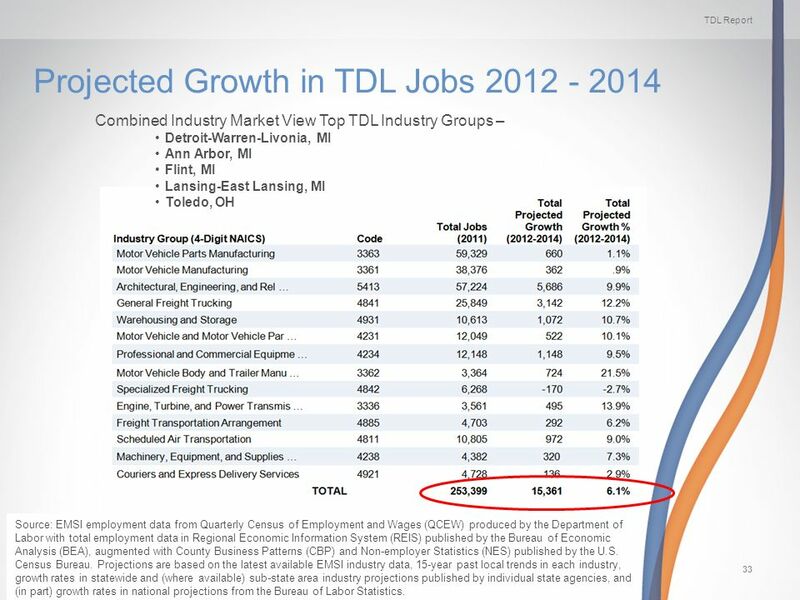 33 TDL Report ManpowerGroup Solutions | Sunday, November 10, 201333 Projected Growth in TDL Jobs 2012 - 2014 Combined Industry Market View Top TDL Industry Groups – Detroit-Warren-Livonia, MI Ann Arbor, MI Flint, MI Lansing-East Lansing, MI Toledo, OH Source: EMSI employment data from Quarterly Census of Employment and Wages (QCEW) produced by the Department of Labor with total employment data in Regional Economic Information System (REIS) published by the Bureau of Economic Analysis (BEA), augmented with County Business Patterns (CBP) and Non-employer Statistics (NES) published by the U.S. Census Bureau. Projections are based on the latest available EMSI industry data, 15-year past local trends in each industry, growth rates in statewide and (where available) sub-state area industry projections published by individual state agencies, and (in part) growth rates in national projections from the Bureau of Labor Statistics. 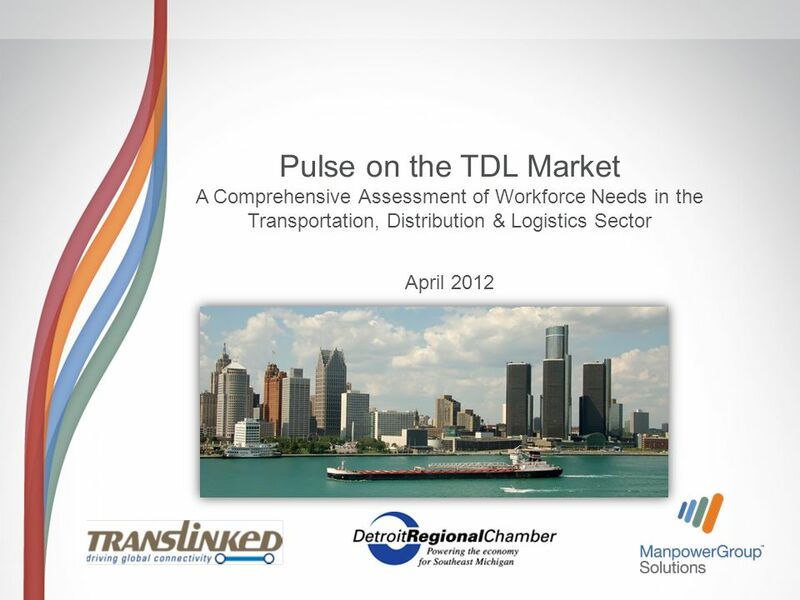 Download ppt "Pulse on the TDL Market A Comprehensive Assessment of Workforce Needs in the Transportation, Distribution & Logistics Sector April 2012." "Layoffs, cutbacks and stress inflicted on employees in the economic downturn have left many of them discontented and disengaged. As this pent-up frustration. ONE-STOP EMPLOYER AND WIB BUSINESS SERVICES Mission: "To provide employers and job seekers with universal access to tools, resources and services that. Midland County Career & College Access Network HHSC March 2014. 6 NOV 2007 Growing Need for Collaboration on Human Talent. Compensation. Today’s Agenda Explore Compensation Issues for NESA Schools What is working and what is not? Are there new trends or issues for which you. Governor’s Office of Workforce Development Two Martin Luther King Jr. Drive 1104 West Tower Atlanta, Georgia Executive Director Tricia PridemoreGovernor. Assessing the impact of an aging workforce across global organizations. Workforce in Iowa’s Creative Corridor Iowa’s Creative Corridor Regional Workforce Development Plan. ©2006 Ann Arbor SPARK 2010 Successes 2011 Opportunities Washtenaw Workforce Investment Board July 8, 2011. 1 Profile of Canadian Environmental Employment LABOUR MARKET STUDY 2010. Technology & Talent: Towards A New Paradigm John Cooksey General Manager, HR & Employment Services. Organizations that will thrive in America’s future are those that are best equipped and able to attract, develop, and retain. 0 Georgia Work Ready Debra Lyons, Director Governor’s Office of Workforce Development August 19, 2010.